Hue is seeking to involve residents and the private sector in developing tourism, seeking to take advantage of the area’s enormous tourism potential by promoting its heritage sites and natural beauty. Also, local authorities will develop policies for residents who want to take part in public tourism programmes, as well as create locals centers for tourism services in the former capital city. At the same time, authorities will have tourism promotional programmes to expose more foreigners and international agencies to Hue’s monuments and natural landscapes. The year 2014 will be the first year for implementing this strategy. Accordingly, tourism sector expects to receive 3 million visits, including 1.3 million visits by foreign tourists, bringing in total revenues of US$139million. Hue Festival 2014, the biannual tourism event focusing on traditional arts, music and dance, along with performances by international art troupes, is expected to serve as the primary tool in reaching this year’s tourism goals. The festival, which will take place in April 2014, however, seems to be less attractive at the international level because its organisers could not work more successfully with global media and Vietnamese media agencies that publish in foreign languages. 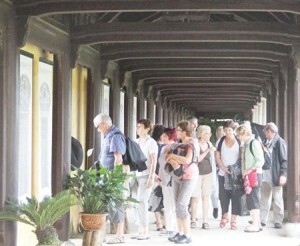 In 2013, Hue attracted 2.5million visits, including nearly one million international tourists. For 2014, local tourism sector officials expect to have 2 million visitors stay over night in the city, though in the past most tourists considered Hue to be a place to visit during the daytime, while they spent nights in the adjacent Da Nang City or Hoi An Town. In comparison with other popular destinations, Hue is lagging behind in providing qualified tours, food and beverage, as well as accommodations for visitors, resulting in slower tourism development, despite the huge potential for tourists wishing to tour monuments, enjoy beaches, the natural landscape, the area’s food, as well as the culture.